Caley Thistle midfielder Liam Polworth. 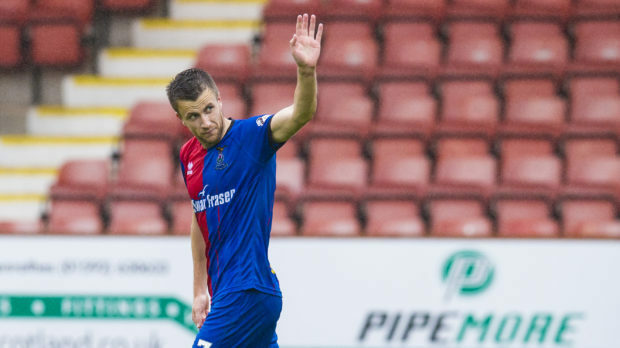 Liam Polworth felt the support of the Caley Thistle faithful after his starring performance in their 3-0 win over Dunfermline. It has been a difficult month for Polworth, after a small section of fans directed abuse at members of his family in the goal-less draw with Ayr United. The club launched its own investigation into the incident and manager John Robertson strongly condemned those responsible, however Polworth delivered a much more positive message on Saturday afternoon. He finished off a flowing move for the second goal and chants of “one of our own” broke out among the band of supporters behind the goal. Polworth said: “A lot has gone on but (hearing my name) is something I’m obviously happy with. I’m sure they were pleased going up the road as it’s a long way to come if you get beat. “It was one of those things – there’s not a lot we can do now. It wasn’t nice at the time and it wasn’t nice for my family, but it’s in the past now. Sometimes you get it tougher because you’re from Inverness but I don’t let it bother me. It’s no big deal; they pay their money and can say what they want to me, obviously without crossing a line. The Caley Jags are second in the table behind Highland rivals Ross County, with an unbeaten four-game start to the new Championship a marked contrast to last year’s stuttering opening.